We’d love your help. Let us know what’s wrong with this preview of The American Agent by Jacqueline Winspear. When Catherine Saxon, an American correspondent reporting on the war in Europe, is found murdered in her London digs, news of her death is con Beloved heroine Maisie Dobbs, “one of the great fictional heroines” (Parade), investigates the mysterious murder of an American war correspondent in London during the Blitz in a page-turning tale of love and war, terror and survival. To ask other readers questions about The American Agent, please sign up. I have been reading this series from book one; this is book fifteen. In this episode Maisie is helping the American Agent that helped her escape from Munich in 1938. They are attempting to solve the London murder of an American reporter. The Germans are bombing England and Maisie and friends are in the middle of the blitz. The book is well written and the plot twists and turns as only Winspear can do it. It is great to get back together with all the regular characters and Maisie. This is one of I have been reading this series from book one; this is book fifteen. In this episode Maisie is helping the American Agent that helped her escape from Munich in 1938. They are attempting to solve the London murder of an American reporter. The Germans are bombing England and Maisie and friends are in the middle of the blitz. The book is well written and the plot twists and turns as only Winspear can do it. It is great to get back together with all the regular characters and Maisie. This is one of my favorite series. I think I preferred the earlier books dealing with World War One and its aftermath. That is what enticed me to read the series. Winspear did a great job revealing the changes in society and particularly women that occurred immediately after WWI, as well as the problems of the veterans. Many of the issues apply to WWII also. I am looking forward to the next book in the series. I read this as an audiobook downloaded from Audible. The book is eleven hours and two minutes. Orlagh Cassidy does an excellent job narratoring the book. Cassidy is an award-winning audiobook narrator and actress. She is one of my favorite narrators. Patricia That's why I started reading this series also. I love the history in these books. Jean Patricia: Thanks for the comment. The history is the best part. I really like this series and have been reading it for years. Unfortunately, I appeared to have missed one and I would have liked to have read it before this one. I would like to have met Mark Scott and read his adventures with Maisie before tackling this one but I was able to keep up. The one thing that niggled me in this book was Maisie's preoccupation with what Scott, an American agent, was doing in London. He told her he was working for the president and it was top secret but she just wouldn I really like this series and have been reading it for years. Unfortunately, I appeared to have missed one and I would have liked to have read it before this one. I would like to have met Mark Scott and read his adventures with Maisie before tackling this one but I was able to keep up. The one thing that niggled me in this book was Maisie's preoccupation with what Scott, an American agent, was doing in London. He told her he was working for the president and it was top secret but she just wouldn't stop trying to find out what his mission was. You would think that she of all people would be more respectful of boundary lines, after all she has lots in her murder investigations. But the entire way through she obsesses on it and it got quite annoying and was completely out of character. Scott and Maisie are assigned a murder investigation of an American reporter, Catherine Saxon, the daughter of an isolationist Senator. Maisie and her best friend, Priscilla, are driving ambulances at night and Saxon actually rode with them to write a story the night she was murdered. Maisie is even more determined to solve the complex murder that has lots of twists and turns. There are lots of personal things going on with her. She is trying to adopt Anna, an orphan, she has been caring for awhile. She has a budding romance with Scott. Priscilla's family is trying to recover from numerous war injuries. Maisie helps both Billy and Sandra's families to her estate to be safer from the horrible bombing. And, of course, there is Maisie's nonstop investigation into Scott's mission. Susan Johnson I know but she knows he's an agent and is supposed to keep secrets. How I loved this book! It may be the first Maisie Dobbs novel I've read but it certainly won't be the last. Such a moving, evocative portrayal of London and Kent under attack from the Blitz in the last weeks of 1940, and a fascinating mystery investigated by a woman I adored. There were tears.... I must seek out more. Review to follow shortly on For Winter Nights. The American Agent has made me a very happy reader. Firstly, because I thoroughly enjoyed the book. Secondly, because it’s introduced me to a new historical crime series (a genre I love) to follow in future. Thirdly because, being the fifteenth in the series, it means I’ve got fourteen previous instalments to look forward to reading. At this point, I’ll assure readers like myself coming new to the series that The American Agent works perfectly well as a standalone read. Naturally, there are a fe The American Agent has made me a very happy reader. Firstly, because I thoroughly enjoyed the book. Secondly, because it’s introduced me to a new historical crime series (a genre I love) to follow in future. Thirdly because, being the fifteenth in the series, it means I’ve got fourteen previous instalments to look forward to reading. At this point, I’ll assure readers like myself coming new to the series that The American Agent works perfectly well as a standalone read. Naturally, there are a few brief references to events and characters from previous books in the series so there are things that won’t come as so much of a surprise as if I’d read the series from the beginning. However, thanks to the skill of the author, I didn’t feel these references gave me the full story. In fact, they left me wanting to find out more about the context in which they had occurred. The nationality of the victim also involves Maisie teaming up with American agent, Mark Scott, (with whom she has history, we learn) to work on the investigation. However, she starts to wonder what has brought him so conveniently to London and just what exactly is the nature of his role especially as Maisie finds herself doing the majority of the investigative legwork (with the assistance of the trusty Billy) despite at the same time doing nightly shifts driving an ambulance through the blitzed streets of London. Furthermore, she has matters of a personal nature concerning her as well. I have to say I can now understand completely why so many readers have fallen in love with Maisie Dobbs as a character. She’s perceptive, independent-minded, thoughtful, observant and compassionate. For various reasons, Maisie feels a personal responsibility to find out who killed Catherine Saxon and this empathy characterises her dealings with other people drawn into the investigation. I particularly liked the way Maisie recognises the impact of sudden death on those touched by it and the investigation that follows, even if this is necessary to find out the truth. ‘She knew that death unsettled any family, but a murder was akin to a bomb dropping – the living were cast this way and that as debris from the investigation fell around them.’ In an especially neat touch, once the case has been resolved, Maisie makes a point of revisiting the key people she’s come into contact with during her investigation, giving them the equivalent of a literary curtain call. I think one thing I appreciate most about Jacqueline Winspear's Maisie Dobbs series is the author's allowing her heroine and those in her universe to experience life's ups and downs without pulling any punches. Maisie has experienced tremendous loss in her life, but manages to take the losses and incorporate them into her psyche, growing and learning, however, painfully from each one. Her life representative of our shared human experience, making it is easy to empathize with Maisie and root for I think one thing I appreciate most about Jacqueline Winspear's Maisie Dobbs series is the author's allowing her heroine and those in her universe to experience life's ups and downs without pulling any punches. Maisie has experienced tremendous loss in her life, but manages to take the losses and incorporate them into her psyche, growing and learning, however, painfully from each one. Her life representative of our shared human experience, making it is easy to empathize with Maisie and root for her happiness. Of course, this is a mystery series and not, on the surface anyway, primarily concerned with the heroine's private life. In the American Agent, Maisie and best friend Pris are ambulance drivers in London during the Blitz. The death and destruction of this period are related to the American populace by radio or "wireless" broadcasts led by famed American journalist Edward R. Murrow. The United States, still in the throes of Isolationism following the Great War, is still reluctant to enter the fight against Hitler. Catherine Saxon is a young reporter who is working with Murrow and hopes to bring America into the fray, despite the disapproval of her politician father and brother. Maisie is asked to investigate when Catherine is found with her throat slit in her rented London rooms. Since Catherine was an American citizen and the daughter of a senator, Maisie is paired with American Department of Justice Agent Mark Scott as she tries to identify the killer. Actual transcripts of radio broadcasts from the era punctuate fast moving events and Maisie's lack of closure from a case years before influence her unraveling of this investigation. Her efforts to adopt her ward Anna and to resist her attraction to the mysterious Mark Scott, who has secrets of his own, make this 15th series entry particularly compelling as Maisie personal life takes some satisfying turns. Winspear is a master of historical suspense and her respect and admiration for her characters is always evident. While each Maisie Dobbs is a not to missed experience, The American Agent is a series standout. Maisie Dobbs is just one of my favorite mystery series! Winspear does a fabulous job of incorporating the time and place. This book takes place during the Blitz of London and you really get a feel for what that might have been like. This story takes place in the 1940s during the London Blitz. Maisie Dobbs and her BFF, Priscilla Partridge served as ambulance drivers helping the wounded from the bombs dropped nightly on London. They meet Catherine Saxon, an American war correspondent on one of their drives. She is later MURDER and Maisie work the case with Robert MacFarlane an agent from America. Maisie is waiting for the approval to adopt Anna The twists and turns the tale takes before there is an answer to what happened to This story takes place in the 1940s during the London Blitz. Maisie Dobbs and her BFF, Priscilla Partridge served as ambulance drivers helping the wounded from the bombs dropped nightly on London. They meet Catherine Saxon, an American war correspondent on one of their drives. She is later MURDER and Maisie work the case with Robert MacFarlane an agent from America. Maisie is waiting for the approval to adopt Anna The twists and turns the tale takes before there is an answer to what happened to Catherine will hold your attention until the surprise ending. I HIGHLY RECOMMEND THIS BOOK AND SERIES. Brava Ms Winspear. You and Maisie have outdone yourselves. Another good mystery, but the real brilliance of this book and others in this series is Jacqueline Winspear’s superlative ability to pull the reader into the time and place of the story. Through her descriptions of her characters and their lives, we are with them in London in 1940 during the blitz. We share their fears, admire their courage and live the events with them. This is marvelous writing by a gifted author. Thank you. For Maisie, the year in 1940, and London is in the middle of the Blitz. And so is Maisie, as she and her best friend Priscilla are doing in London what they did in the Great War so many (and so few) years ago. Her worlds collide. One night, Maisie and Priscilla have an observer on their ambulance run – a female American journalist. Cath Saxon is reporting the war from a woman’s perspective – with the hope of becoming one of the “boys” working for and with Edward R. Murrow. Geannie Bastian Good review! The only thing is the character is Priscilla, not Patricia. That confused me for a minute. Marlene Geannie wrote: "Good review! The only thing is the character is Priscilla, not Patricia. That confused me for a minute." THANK YOU SO MUCH for letting Geannie wrote: "Good review! The only thing is the character is Priscilla, not Patricia. That confused me for a minute." I do love a Maisie Dobbs story and have been reading Jacqueline Winspear’s fab series for years, not always in order as it depends what the library has in stock, but one thing’s for sure, I always love catching up with Maisie. I love finding out what’s going in her personal and professional life, like I’m catching up with an old friend. This 15th book in the series, is set during the blitz of World War Two, as Maisie and her best friend Priscilla are volunteers driving ambulances through London’s I do love a Maisie Dobbs story and have been reading Jacqueline Winspear’s fab series for years, not always in order as it depends what the library has in stock, but one thing’s for sure, I always love catching up with Maisie. I love finding out what’s going in her personal and professional life, like I’m catching up with an old friend. This 15th book in the series, is set during the blitz of World War Two, as Maisie and her best friend Priscilla are volunteers driving ambulances through London’s bombed out streets. Priscilla has been Maisie’s best friend since they were at Girton College together before World War 1 and have seen each other through thick and thin. I really like Priscilla and think she would be a great friend to have around as she’s always trying to get Maisie to see the lighter side of life and not be so focussed on her detective business. I’ve always enjoyed how Maisie works her cases and I particularly liked her compassion towards the victim in this book, something I haven’t really come across in other crime novels. I also enjoyed the way she draws up her case maps back at her office during the different aspects of the case with Billie, her faithful employee from the first books in the series. The added subterfuge of Maisie working alongside an agent of the US Department of Justice added an extra dimension to this murder mystery. Who could Maisie and Billie trust? Her friend in the Special Branch, the American Agent or perhaps neither? The historical aspect to this novel regarding the isolationist stance the USA took towards their involvement in World War Two was fascinating. It really brought home how devastating Britain’s position was during the blitz and how they desperately needed help from America, if only they would believe what was truly happening in London. As to solving the mystery? Well, I had so many theories and suspects right from the first few pages of this book but I didn’t work it out, I wasn’t even close!! Naturally, I do not want to talk to much about the plot, this is book 15 in the series and naturally, things happen along the way, you would want to find out for yourself as you are reading them. 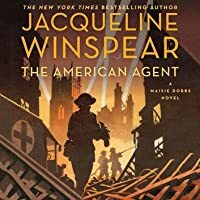 Let’s just say this: The Blitz has started and London (and the rest of the country) experiences horrific bombing attacks eac The latest Maisie Dobbs – The American Agent by Jacqueline Winspear is coming out on the 26th of March and I was lucky enough to get a review copy via Edelweiss. Thank you so much. It's September, 1940, and the German Luftwaffe is blitzing bombs down on London nightly. Maisie, who you may recall was a nurse on the battlefields in France during WWI, and her best friend Priscilla Partridge have volunteered to be ambulance drivers, doing what they can night after night to help the injured. One night, a young American journalist, Catherine Saxon, rides along with Maisie and Priscilla. Catherine is writing accounts of the Blitz for Americans and is hoping to become one of "Murr It's September, 1940, and the German Luftwaffe is blitzing bombs down on London nightly. Maisie, who you may recall was a nurse on the battlefields in France during WWI, and her best friend Priscilla Partridge have volunteered to be ambulance drivers, doing what they can night after night to help the injured. One night, a young American journalist, Catherine Saxon, rides along with Maisie and Priscilla. Catherine is writing accounts of the Blitz for Americans and is hoping to become one of "Murrow's Boys" - American reporters based in London, working for Edward R. Murrow on BBC radio. The sense of living —ironically, fearfully, courageously, determinedly— through the experience of the London blitz along with the characters is the highlight of this installment in the Maisie Dobbs series. Increasingly, though, I wish for a more complex protagonist. Maisie is interesting, unusual, and likable, with a complex life worth reading about. But she’s missing a level of human realism that makes her just miss the mark of full believability and engagement. While I don’t find her persisten The sense of living —ironically, fearfully, courageously, determinedly— through the experience of the London blitz along with the characters is the highlight of this installment in the Maisie Dobbs series. While I don’t find her persistent poise, equilibrium, elevated maturity, insight, and unrufflable goodness unbelievable on the surface, I want to see at least occasional conflict and struggle underneath that would make this way character fully believable and human. She experiences plenty of conflict and struggle in her life, and isn’t emotionally one-note. But that steady mature goodness without an internal offset is largely what keeps this series nearly but not close enough to being literary mystery. I don’t look for great psychological depth in all my mystery genre protagonists, welcome as that would be. But this series is *about* psychological depth, and comes just close enough to delivering that depth that I keep looking for the portrayal of the protagonist to live up to that higher promise. Still, this is a satisfying and interesting historical mystery series with none of the fluff or sap that tends to spoil for me much otherwise promising or satisfying historical fiction these days. A solid entry in a really good series, good enough that I crave just a little bit more. Winspear continues her wonderful historical mystery series set in England in the early 20th century. It's a turning point for Maisie as she realizes the importance of family and good friends during the Blitz. I especially enjoyed the references to Joseph Kennedy, who was the American ambassador in London during this time. This literary mystery series is best read in order as it moves in time. It is the middle of the London Blitz, and Maisie Dobbs is still operating as a volunteer ambulance driver, and waiting for the decision about whether or not she can adopt Anna, the evacuee that she has guardianship of. Things get complicated, however, when Maisie is pulled in to investigate the death of an American correspondent, Catherine Saxon. But investigating the murder has brought someone back into her life that she never expected to see, the American agent she met in Munich, Mark Scott, a It is the middle of the London Blitz, and Maisie Dobbs is still operating as a volunteer ambulance driver, and waiting for the decision about whether or not she can adopt Anna, the evacuee that she has guardianship of. Things get complicated, however, when Maisie is pulled in to investigate the death of an American correspondent, Catherine Saxon. But investigating the murder has brought someone back into her life that she never expected to see, the American agent she met in Munich, Mark Scott, and she is tasked to work with him. As Maisie is entrenched in the investigation, she is plagued with worry over Anna and her friends and family, but is especially disconnected that she feels like she may be falling in love again. One of my very favorites in this series! We, along with Maisie, see a very different side of WWII as she both works on an ambulance crew as well as investigates the murder of an American journalist. I really enjoyed the personal aspects of Maisie's life and hope the author continues the series. Well done! I'd give this about a 3.75 if I could. 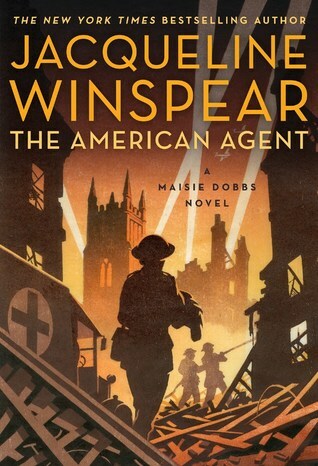 The war years continue to be a vast improvement in the Maisie Dobbs series--I guess Winspear's writing itself has improved, though there's still a humorless edge to her books that makes the characters flatter than they could be. And the sticking point for me continues to be the plots, which at some point muddle, then get neatly finished at the end. Her fans won't care. Vintage Maisie!!! Yay. Thank you Emilie for loaning me an ARC. Wonderful!!! last couple in series haven't been particularly memorable but loved these characters and story! Another moving and well constructed story. In The American Agent, the fifteenth novel in the Maisie Dobbs series, we find our titular heroine working as a volunteer ambulance driver during the 1940 London Blitz. A tale of triumph over tragedy, it is sure to please the author’s many fans. While the mystery portion might work fine as a standalone, the book is definitely best read in sequence with the rest of the series since there is a prodigious amount of background information pertaining to Maisie’s personal life the reader would benefit In The American Agent, the fifteenth novel in the Maisie Dobbs series, we find our titular heroine working as a volunteer ambulance driver during the 1940 London Blitz. A tale of triumph over tragedy, it is sure to please the author’s many fans. While the mystery portion might work fine as a standalone, the book is definitely best read in sequence with the rest of the series since there is a prodigious amount of background information pertaining to Maisie’s personal life the reader would benefit from knowing before jumping in. One night while on ambulance duty with best friend Pris, Maisie and her pal meet American journalist Catherine Saxon, who reports on the terror stalking London for news agencies back home. Catherine is on the verge of a big opportunity in her career – the chance to host a radio program for the same agency that employs the famous Edward R. Murrow. If she makes a good impression with this premiere broadcast, she might be able to turn it into a regular gig. Determined to get all the information she can to make her show a success, Catherine is spending the hours before the transmission deep amongst the people she will be reporting on. Impressed with her willingness to join them on their dangerous rounds, and Catherine’s ability to interview the victims and first responders with tenacity and gentleness, Maisie parts company with the journalist feeling she has found a new friend. It’s a short-lived acquaintance. Catherine is found murdered in her flat the very next morning. Over the last few years I have tried dozens and dozens of historical mysteries with supposedly strong female leads and none of them have come close to Maisie Dobbs. The stories just flow and it is so easy to fall into them and be carried along. There is also a really depth and substance the characters and even if the investigation begins to falter there is still enough happening in the background to keep you interested. As usual this investigation is quite complex and I was three quarters of the w Over the last few years I have tried dozens and dozens of historical mysteries with supposedly strong female leads and none of them have come close to Maisie Dobbs. As usual this investigation is quite complex and I was three quarters of the way through the book before I began to get an inkling of who was the perpetrator. In fact I was a little bit disappointed when the crime was unravelled, but I was pleased with the way all the loose ends were wound up. I couldn’t put this down. The characters, both new and old, were so very sympathetic, and this reader, like Maisie, wanted justice for poor Cath. Winspear does a tremendous job of conveying the horrors of London during the bombings, and the tension of the atmosphere. I only wish this book had had a copy editor who did a good job. The errors in the text were jarring in such a superbly crafted novel. Maisie Dobbs is a favorite series and as the Germans bomb London in 1940, another war becomes the backdrop for a murder investigation. The rationing, blackouts and bomb shelters are skillfully interwoven and Maudie’s detective skills that utilize her powers of empathy and deduction are once again reaching to the heart of the matter and of the day. I loved this book!!! I think I read every Maisie Dobbs book and recommend this one and all others, and hope the series continues. Perhaps sometime in the near future Jacqueline Winspear could co-write with Charles Todd so Maisie Dobbs and Ian Rutledge can work together to solve some mysteries. Thank you Goodreads, I won a copy of this book by entering a Giveaway. Possibly the best one yet! Once again I listened on audiobook and the narrator for these books does SUCH a good job. The story was captivating and at one point it had me crying in my car. I hope this series continues for a long long time! Jacqueline Winspear was born and raised in the county of Kent, England. Following higher education at the University of London’s Institute of Education, Jacqueline worked in academic publishing, in higher education and in marketing communications in the UK. She emigrated to the United States in 1990, and while working in business and as a personal / professional coach, Jacqueline embarked upon a li Jacqueline Winspear was born and raised in the county of Kent, England. Following higher education at the University of London’s Institute of Education, Jacqueline worked in academic publishing, in higher education and in marketing communications in the UK. A regular contributor to journals covering international education, Jacqueline has published articles in women's magazines and has also recorded her essays for KQED radio in San Francisco. She currently divides her time between Ojai and the San Francisco Bay Area and is a regular visitor to the United Kingdom and Europe.